Custom Routing | City Sign Company Inc.
City Sign Company is known for their long-standing commitment to excellence in the sign industry. Now we would like to prove to you that we will carry the high standard into our new manufacturing / production department. 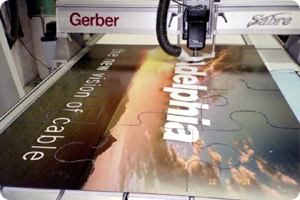 We now have the Gerber Saber 408 Routing system. PVC, Gator Foam, Budget Foam, Sign Foam, Red Wood, Cedar, Ultra Board, Aluminum, Corex, Lexan, Plexiglas, MDO Plywood Dibond, Alumalight and much more. We are discovering new products everyday. Add this small list of products to the endless list of laminates available and the possibilities are limited only to your imagination. Since our router is run using Gerber software, we are able to combine computerized graphics with routed shapes to provide a unique and distinctive look your company needs to stand out from the others. We are a local company, which means you will be able to see the products you have chosen in person to make sure you get the look you want. This also means there will be no shipping cost incurred or damage that can result in transport. Faster turnaround times also means you will have your sign up and ready for the public to see in less time. We are dedicated to working with you for you. We provide detailed full color drawings of your signs for approval before it ever goes into production. Contact us today and let us know what we can do for you! © 2019 City Sign Company Inc.